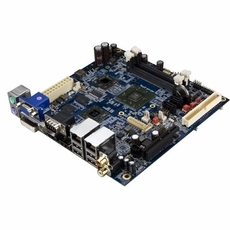 The VIA VB8003 Mini-ITX board combines a 1.6GHz VIA Nano processor, VIA VX800 unified media system processor and an DX10.1/ OpenGL 3.1 S3 Graphics 435 ULP onboard discrete graphics processor, offering system integrators the perfect platform for the development of next-generation digital devices that take advantage of today's high resolution HD multimedia content and the latest graphics architecture. The VIA VB8003 Mini-ITX board features a comprehensive array of on-board multimedia I/O, including two HDMI ports, a DVI port and a VGA port. By harnessing the power of both the S3 Graphics 435 ULP graphics processor and the integrated IGP of the VIA VX800 MSP, the VIA VB8003 can be configured to power up to four, independently configurable displays at resolutions up to and beyond 1080p. The S3 Graphics 435 ULP dedicated graphics processor is specially designed to provide advanced multimedia capabilities for next-generation embedded applications and is the lowest power DX10.1 / OpenGL 3.1 GPU on the market today. The S3 Graphics 435 ULP also features the ChromotionHD engine, providing true HD quality 1080p playback on the latest HD standards including Blu-ray Disk, H.264, VC-1, WMV-9, MPEG-2 and AVS, at resolutions of up to 2560 x 1600 pixels.